The Transit Investment Strategy Advisory Panel has ventured off its supposed path of looking at ways to fund transit growth in the GTHA to at least one proposal for a change to the Metrolinx Big Move plan. This showed up at recent open houses in a handout that is not yet available online. 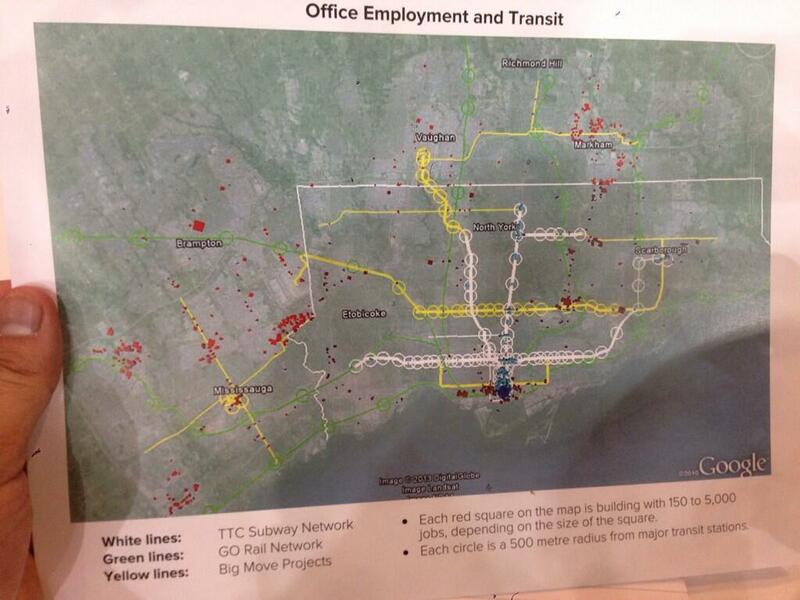 The purpose of this map is to show how office employment is not sited along existing or proposed rapid transit lines. With this as a jumping off point, the Panel suggests there is a need for a “Big U”, a much enhanced GO Transit route from Meadowvale, through Union Station and then north via the Uxbridge Subdivision (Stouffville line) to Markham. A related factoid (one of those handy bits of information whose presence is supposed to silence critics) is that employment concentrations generate far more transit usage than residential ones. It is certainly true that it is much easier to serve a place like downtown Toronto with a transit network that acts like a big funnel, but this does not eliminate the need to serve the residential ends of those trips. Toronto’s Bloor-Danforth subway and GO’s commuter lines, for example, spend much of their time running through comparatively low-density neighbourhoods, collecting passengers as walk-ins, park-and-rides, and transfers from the surface transit network. Every time a new transit route is proposed, we hear how it will only be viable if stations are surrounded by huge condo developments. This is utter nonsense because any transit route has a catchment area. The problem is to ensure that transit, sidewalks and bike lanes serve that area and deliver riders to a network that will take them where they want to go. What is missing from the chart above is any indication of where the people who work in those centres actually live. Looking at the Meadowvale end of the line, how many people come from the area that would be served by the GO corridor and a feeder network to it? There is a lot of territory north, west and south of Meadowvale for which a rapid transit line to the east will do absolutely nothing. Similarly, many who work in Markham live west, north and east of the employment centres. Indeed, most of the red dots on that map are well west of the rail corridor. Much as I sympathize with the Panel’s desire to get people talking about how parts of any network proposal might actually serve the region, I fear that we are seeing a classic example of someone who got out their crayons and drew a map. The job will quickly change from discussing the philosophy of transit planning (and, don’t forget, funding) to defending the specifics of a proposal. That is precisely why I have been so restrained about getting out my own crayons except in special circumstances. The recent Don Mills Subway discussion needed a line on a map to illustrate how the “downtown” focus needed to change. Well over half of the debate this triggered became a matter of dueling proposals between “my” line and “your” line that added little to the real issue — the need to see what such a line could connect and serve beyond simply diverting trips away from Bloor-Yonge Station. People would even argue that there wasn’t “enough” development in some locations to justify such a route ignoring what is there today, what is in the pipeline for tomorrow and what could occur with planning and political encouragement. Meanwhile, we build a subway to land that was recently the middle of nowhere, and propose one through miles of low density residential development as a vote-buyer claiming that only with a subway will Scarborough reap the development it “deserves”. There is one big problem with the “Big U” — it diverts attention from the “little u” otherwise known as the “Downtown Relief Line”. It doesn’t help one bit that the version of the “little u” shown on the map is the Pape-Queen-Roncesvalles alignment, one that is guaranteed to be very expensive and fails to recognize shifting development patterns (ironically, one of the goals of the “Big U”). It ignores the southerly shift of population and jobs, avoids the available Weston rail corridor where we are spending a fortune to intensify transit infrastructure for a Toonerville Trolley to the airport, and it stops at the Bloor-Danforth subway missing the opportunity to reach further north to be more than a “downtown” line. “Alternatives analysis” is a fine art in many projects, but the real art for many agencies is to ensure that what you always wanted to build is the “preferred” choice. This is often guaranteed by setting up straw man comparisons so that the one you want shines out as the best of breed. Such may be the situation with the DRL where, on darker days, I suspect that the whole idea is to paint as grim a picture as possible so that it will never be built. Remember that the TTC for decades claimed we didn’t need a DRL, that they could stuff everyone into an upgraded Yonge-University line. Expanding YUS capacity on a heroic scale was their “preferred alternative”. With the Big and little U’s, we risk being trapped into specifics of route designs that looked good on a napkin in a bar, but which need much more thorough discussion as to purpose and specifics. They are good as starting points for discussion, but are most definitely not the final answer in their respective fields. Moreover, they are not alternatives to each other, a point that is often lost as the political imperative says “build in the suburbs, not downtown”. The Big Move and the Investment Strategy that supports it have one gaping hole. Very little attention is paid to the role of or funding for the feeder network to a regional system. Moreover, the plethora of lines on the map hides the fact that many of them will not have the most frequent service on the planet. Not all “rapid transit” lines are created equal. As a recent Metrolinx report noted, the growth in “rapid transit” recently has mainly been in “BRT Light” for which the infrastructure requirements are minimal along with the service levels. Crowing about progress in bringing transit to the millions ignores the question of how attractive that transit will be and how people will connect from the trunk routes, such as they may be, to their homes, work and other destinations. This will be an important issue for network design on both the Big and little U’s. One would serve rail corridors and be totally dependent on local service to deliver riders from homes and to employment locations. The other would serve established and growing neighbourhoods and would enjoy an existing, well-developed set of local transit services as feeders. These are not trivial differences, but they show the problems that will arise if the study does not look beyond the edges of station platforms. This is the real debate the Transit Panel should engage — does The Big Move really serve the market it claims to address? How useful will it be in attracting trips out of cars and onto transit? Can developers and owners of residential and employment properties expect a real improvement in travel to and from their developments, or will their value be strangled by poor access? Underlying all this is the basic question of whether we are spending all of those billions in the “right” place and what benefit each component of the proposed network will achieve. That speaks directly to the concept of spending wisely, not just for the sake of generating construction jobs and photo ops for the next generation of politicians. Returning to the “little u”, there will be a motion before Council from Councillor Josh Matlow, seconded by Cllr. John Parker (also a member of the TTC Board), to accelerate work on the EA for a “Relief Subway Line”. Moreover, it asks that Council confirm such a route as “Toronto’s next subway expansion priority”. It will be intriguing to see how this motion fares amid the current circus at City Hall, the recent battle over the Scarborough Subway and a faction claiming that downtown “has enough subways” already. There is no point in doing a study if the underlying desire at the political and staff level is to sell a “Big U” as a replacement for the “Relief” line, whatever we call it. The terms of reference must ensure that all options are reviewed, including cross-jurisdictional issues such as repurposing the Weston corridor’s UPX trackage for rapid transit. We must not prejudge the outcome by requiring one continuous line to serve both legs of the U/u, especially considering that in some variants both western legs run in the same corridor. Will Toronto Council, Metrolinx and Queen’s Park embrace the need for a full study of these routes without prejudice toward any preconceived doodlings on maps?